The bands from Seattle like Soundgarden, Mudhoney, Pearl Jam and Nirvana made their biggest impact in the 1990s, but had already been playing for a few years by the time they broke through. Isolated from much of the U.S. in its Northwest location, the music grew up as an underground subculture, supported by the SubPop label – indeed, the first most people heard of it was at the end of the 1980s when it was covered by the British music press, which promoted it to fame. 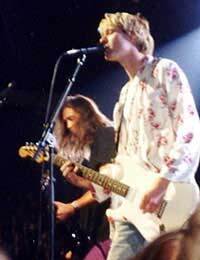 Of the Seattle groups it was really Pearl Jam and Nirvana who struck global chords, and Nirvana’s status was assured by the suicide of founder Kurt Cobain in 1994. Sadly, early, tragic death attracts fans and collectors. Together, the bands seemed to sum up the isolation of the generation that came of age in America at the beginning of the 1990s. If you can find posters for early gigs – and they definitely exist – they’d represent a good, if fairly modest, investment. Both bands played in the Seattle area (in the case of Nirvana, fairly extensively) before they found fame, and had a number of local fans. In fact, it’s possible to obtain posters going back to the mid 80s for bands like Soundgarden and others that made up the scene. Even in death, Cobain remains an icon, and artefacts related to him have gone for impressive prices. A Mosrite guitar he played, for example, took over £65,000 at auction, a stunning price for someone who’d been a star so recently. His status was confirmed when his widow, the controversial Courtney Love, donated his favourite sweater to a charity auction, where it was rumoured to have brought £60,000. On a far more modest level, you can find a concert ticket from 1994 for £40, or, for the downright ghoulish, a copy of Cobain’s death certificate for a fiver. Make sure you distinguish between the true memorabilia and the modern items however, like the Cobain action figures brought out in 2007. You’ll do better looking at dealers offering an RIAA platinum video award for £250, or an in-house award for £400. Or, if you want to spend a bit more, try £1,000 for 1993 autographs (with a certificate of authenticity) from all three members of Nirvana. Pearl Jam prices don’t reach such spectacular heights – a fully signed photo, for instance, was sold by a dealer for a hair under £90, and a framed backstage pass was only £30. A few rare posters can go up to the £200 mark, but others fetch £20-30. The great difference is that, for the moment at least, most Pearl Jam memorabilia is in the hands of fans. The band will occasionally give an item to a charity auction (as they did in 1999, contributing an autographed copy of their album, Vs.). Beyond that, there’s very little – fans seem to have their hands on many handwritten items, with the blessing of the group. It’s probably pointless to say that good Nirvana items have the greatest investment potential of any modern group, especially anything directly related to Cobain, like handwritten items, drawings, and so on. These will shoot up in value over the next few years, so any you can buy, at a reasonable price, should virtually guarantee you an excellent return. As to other Seattle bands, items are likely to remain mostly the province of the collector for the foreseeable future.